6th Annual Garrison School Freedom Tree Lighting and screening of "Selma: The Bridge to the Ballot"
In celebration of the 6th Annual Garrison School Freedom Tree Lighting Celebration and the 50th Anniversary of the Voting Rights Act of 1965, The Clay County African American Legacy, Inc. will host a screening of Selma the Bridge to the Ballot, a short yet powerful documentary which tells an important aspect of the story not touched on by the Hollywood feature – the true story of the forgotten heroes of the fight for voting rights, the courageous students and teachers in Selma, Alabama, who stood up against injustice despite facing intimidation, violence and arrest. Friday, December 4th, 6:30 p.m. These activists achieved one of the most significant victories of the civil rights era and the film is a powerful reminder that each person has the ability to bring about social change. The Freedom Tree Lighting Ceremony annually celebrates the ratification of the 13th Amendment to the American Constitution made in December 1865 that abolished slavery. This year the focus of the ceremony will be on the 15th Amendment that gave African Americans the right to vote. The tree for the ceremony is a 7 ft. White Pine donated to Garrison by Myron Schmitt of Holt, Missouri. Mr. Schmitt presented former President Bill Clinton and the First Family a tree from his Santa Tree farm in 1994. 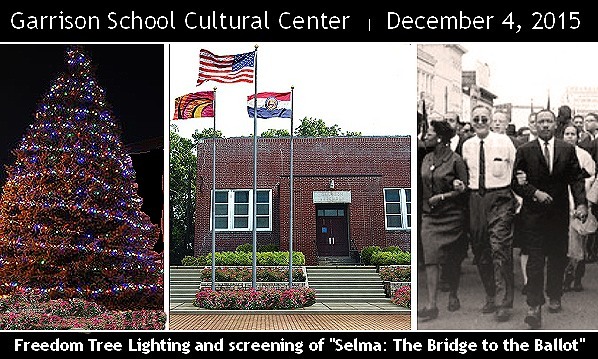 There will be a reception immediately following the tree lighting and viewing of the documentary. Attendees will be invited to participate in a community discussion following the Tree lighting and film screening. The event is free and open to the public.